Tarot history is one of the most exciting arenas through which to learn to read the cards. NeoPlatonism and Renaissance Humanism provided us with a set of visual designs describing humanity’s role in the cosmos that gives deep meaning and purpose to our lives. From these rich beginnings, Tarot has continued to draw on the most profound understandings of each historical period. After an overview of the history of Tarot, which takes us through the streets of Milan, Ferrara and Bologna, Mary Greer focuses on the Lovers card as an intriguing example of how our ideas about it have changed through the ages, Included with the recording are a copy of all the slides and a worksheet for a three card layout featuring the Lovers. The questions on the worksheet are derived from history-based interpretations for the Lovers and open up new ways of looking at this card when it appears in a reading. In 2007, she received the International Tarot Lifetime Achievement Award from the Association for Tarot Studies. 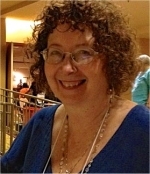 As an independent scholar, writer, teacher, and professional tarot consultant, Mary sees herself as a ‘midwife of the soul.’ She advocates using card reading techniques that are interactive, transformational and empowering and takes a revolutionary approach to teaching that emphasizes personal insight, creativity, and breaking all the rules. Visit her website at https://marygreer.wordpress.com/ . You can download a video recording of the class as a Windows Media file (.wmv). It can be viewed on PCs using Windows Media Player and on Macs using the free VLC multimedia player for Mac operating systems which can be downloaded here.